Valentine’s day has come and gone and I’m not going to let it get to all the way to March before I post about it! It was Grayson’s first Valentine’s Day so in the morning I planned for extra time to get pictures of Elin and Grayson together opening their gifts before I took Elin to school and helped out at her Valentine’s Day party at school. I absolutely love this photo of Grayson peaking into Elin’s gift bag to see what she got! Elin received a book and a Cinderella lipgloss set and Grayson received a book and the softest little stuffed bear. I enjoyed spending time with Elin and all her little school friends for the party and later on that day she and Grayson received more gifts from Nanny and Papa and then her cousins Ethan and Max. Please notice that somehow Grayson knew it was silly picture time and he stuck out his little tongue, too! Later that night Elin and I had so much checking out all her Valentine’s from school. She was so proud of her little bag she made. She said the hearts were made from her thumb print. Such a cute idea. Elin and Grayson had a wonderful Valentine’s Day and they got some beautiful Valentine’s from of our favorite bloggers. I have gotten to know some of these bloggers well over the years and I’m happy to count them as friends. I love reading all about what their children are up to and we exchange fun stories in our facebook groups. We always try to go a little Valentine exchange with the kids so they get some fun and happy mail to open. This year did not disappoint. Elin loved opening all the cards and hearing all about her pen pals. We made sure to display our Valentine’s front and center in the playroom. Check out the other bloggers who participated. Last week was Elin’s Valentine’s Day party at school and I was in charge of the games. She was so excited when I came in the classroom early to set up. The assistant teacher was out that day, so when I got there I helped Elin and some of her classmates pass out their Valentines before the party started. Then it was time for the party. Coming up with fun ideas to entertain 3-4 year olds is not easy. After trying to think of creative ideas, I gave up and decided to purchase a Valentine-themed ring toss and bean bag game. I think all the kids liked the games and it was something I can use for the next couple of years for class parties. Then I just got a simple foam craft where the kids decorated little puppies. They all seemed to enjoy that as well. Then after a special snack I passed out conversation hearts and had them stack them to see who could make the highest stacks and then sort them by color. After the party, Elin was eager to check out all the Valentines she got from her classmates. I think she could get used to opening all these special treats from friends. Then here are some pictures of Elin opening her gifts from us on Valentine’s day. She loved her singing and dancing bunny, Disney Tsum Tsums, stickers, and Sweetarts. She was certainly spoiled but so worth it. She is our little Valentine! Valentine’s Day is almost upon us and I was so excited to participate in another blogger Valentine exchange. Elin was thrilled as well. She has been so eager to open up all the mail that has been coming her way and finally it was time for her to check out all the beautiful Valentines. All the Valentines were so creative and it looked like everyone spent a lot of time and effort to make their lovely creations. Elin was so excited she was literally shaking and smiling the whole time. Of course some of her favorites had edible items. After she opened all the Valentines, we chose to display them on some pink baker’s twine, then I used tiny white clothes pins to hang them. It makes the playroom look so festive. Here is a closer look at all the creations. Here are the Valentines we sent to everyone and here is the post about how we made them. Here is a link to the Valentine exchange from last year. These have been so much fun and a great way to get toddlers excited with mail. Check out the posts from all the other fantastic bloggers in the exchange. Elin and I have been hard at work on making Valentines already. She is passing them out at school this year and we are participating in a blogger exchange. We made heart shaped crayons for Valentine’s day last year and I loved them so much I considered making them again but thought we should try something different. 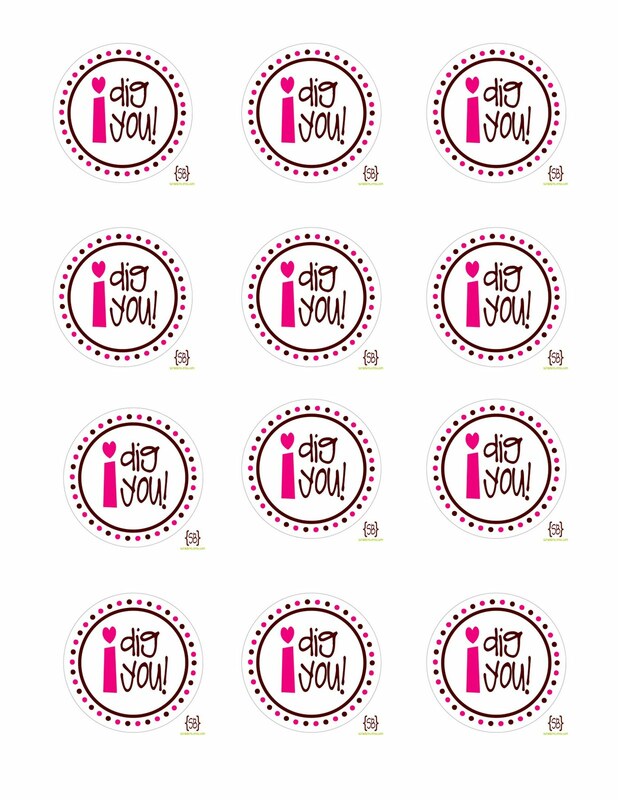 There are so many cute ideas out there on Pinterest that it was hard to just choose one but we decided to make these fun, “I dig you” valentines. I like that there is candy and a little toy involved. I figure the shovel can be used in sand boxes and the beach this coming spring break/summer. After searching for a printable, I finally found these and they printed great. 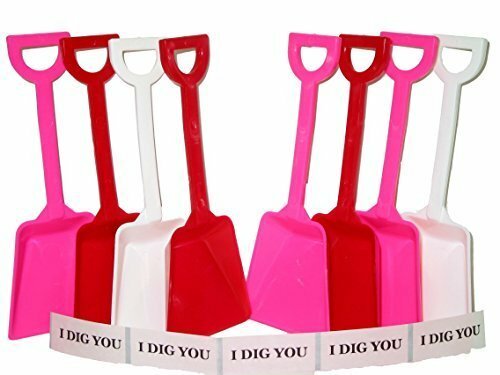 Then I searched Amazon and found these red, pink and white shovels. These were the perfect size and color. I was very happy with this seller. Lastly, I decided on getting the valentine starbursts because they are a wrapped candy and I felt like it was probably better to pass out candy that was wrapped at school. I will warn you that Elin thought she was helping by just sitting next to me and eating the starburst but I was still happy she was part of the process. I love how they turned out and I can’t wait for her to pass them out at school. This was such a fun and easy Valentine idea. Since Elin is enthralled with all things Valentine related, I decided to have a Valentine themed playdate. When I floated the idea by her, she was beside herself with excitement! She knew one thing for sure….that she wanted cupcakes and balloons. She got a lot of inspiration from all the Valentine books we have been reading. I made some heart garlands out of some pretty glittery scrapbook paper to make the house more festive. I have no idea why I decided making my own was better than finding something in the stores, but I love how they turned out and the scrapbook paper was super thick so they should be durable to use year after year. We then got got some yummy cupcakes for dessert after our lunch of peanut butter and jelly cut into hearts, strawberries, and carrot sticks. Last but not least, some pretty springy flowers were needed to brighten things up. She was expecting two friends from ballet and story time, but sadly one could not make it due to a medical emergency. Although that was sad, Elin was super excited for her friend Lydia to come! Lydia came bearing some very nice Valentine sweets! They both looked so cute in their Valentine attire. The girls enjoyed eating at their little table by themselves. They switched spots a few different times and ate off each other’s plate. Then they were eager to get upstairs and just play kitchen for awhile. We coaxed them to go back downstairs to work on making necklaces. They enjoyed Valentine gummies and heart marshmallows while we mostly made their necklaces for them. At this point, it was evident that both girls were getting tired and ready for naps. So they sat quietly on the couch for awhile and read and then watched a little Mickey Mouse Clubhouse. I love how they have the same expression in this photo. They were both staring at the television, enthralled by it. Even though the girls were tired they hated to part ways, they gave each other many hugs and held hands for awhile before Lydia left. I think they had a good time together! I was thinking about how I should do this again next and then I realized that since Elin will be in preschool next year, she will start having holiday parties at school! After a little nap, Elin was excited to have her cousins stop by for awhile. They exchanged Valentines and had some sweets. Elin got right to work playing with her new Minnie Mouse stamp set she got. Then on Saturday, Elin went to a birthday party for her friend, Frances. The theme was My Little Pony and her mom and grandma outdid themselves with beautiful party decor and fun games! This was the first birthday party Elin has been to where there were games for the kids and Elin loved it! She wasn’t quite herself during the party due to a runny nose, but she had a great time and talked about the party the rest of the weekend. They also made necklaces, wands, and got manicures. Elin will never let me paint her nails but she did it!! She let me paint them and seemed to love it! She let them dry and kept showing me her pink nails, but on the way home she sort of bit her nails and ate the polish off! I hope if we try it again I can prevent her from doing that! All the kids were spoiled with awesome favor bags that were filled with lots of goodies. Elin is now a huge fan of “ponies” as she calls them and we watched a few episodes on demand when we got home. Elin also wore her party hat all evening long and we finally took it off her when she went to bed! It was such a fun weekend with all the parties and festivities!! Do you remember making and buying Valentine cards to pass out at school in elementary school? Wasn’t it the most exciting day ever when the teacher would pass out the white lunch bags to decorate and set up as a mailbox to collect cards in? I can’t even imagine how much more awesome it probably is now with all the creative ideas floating around on Pinterest and on blogs. Emma from Harper and Will and I partnered up to put together a fun blogger Valentine card exchange. Our mission was to create some homemade and creative Valentine cards with our children and then exchange them with some of our blogger friends who all have children around the same age. Elin and I had a blast making heart shaped crayons and packaging them up with coloring books. Check out this post to see how we made our heart shaped crayons. I found the printable here. We mailed off our cards all throughout the country and had fun seeing all the cards arrive for Elin. We waited until we had received all our cards and then Elin sat down opened up all her goodies. She was so excited at seeing all the beautiful cards. After she had ample to time to admire her cards and play with them, I decided to hang the cards up so we can appreciate them more and use them as decoration. I love how our little garland turned out. Check out everyone who participated in the exchange and see how they made their beautiful cards. I’m a sucker for buying cute holiday related items for Elin. The Valentine stuff especially just calls my name with all the pink and heart adorned items. The past two years I just bought her a gift or two and gave it to her on Valentine’s Day but since I saw so many cute smaller items this year I decided to get her a small gift item for each day of the month of February leading up to Valentine’s day. Most of the items are books because we are working on growing her Valentine book collection. Then some items were found in Target’s dollar section. What would I do without that section? Why is Target’s dollar merchandise so much better than anything you can find from any regular old dollar store? So far Elin is enjoying getting her little gift each day. It’s something fun for the entire Valentine season. I’m a few gifts short but I plan on doing some more shopping. The weekend went by all too fast as usual. On Friday night, Elin and I worked on some special Valentines for some far away friends and then we finished up the final packing on Saturday morning and made a trip to the post office to mail them off. I took some pictures of her making the Valentines but I’ll save those for a future post. Right now the Valentines are top secret. Then we went to Gymboree as we usually do. As Elin napped, I decided on a whim to check if there were still tickets to Disney on Ice and as luck would have it there were–and good seats! So, even thought there were just a few hours before the event, I went ahead and purchased tickets and surprised Elin with the news when she woke up. Elin enjoyed the show and stayed engrossed in the show the whole time. The music was pretty loud but she didn’t seem to mind. Her favorite parts were the ones that had Mickey& Minnie and the whole gang, Snow White, and Ariel. She also loved the flying Tinkerbell. She also couldn’t keep her eyes off the palace. She kept asking us who was going to come out the door next. She also kept saying she wanted to go in there. She was so excited to see her friend Kelsey as we were leaving. She was hugely disappointed that Minnie and Mickey were not outside. She thought they would be there for photos and she kept asking where they were waiting for her. Then she broke into a run when she saw the souvenir stand. I felt awful not buying her anything, but nothing looked awesome to buy so I told her that her extra special souvenir was waiting at home and that should would get it in the morning since it was bedtime by the time we got home. That worked and luckily I keep a bin of future toys when I see good things on Amazon or at a store. In the morning, she was the proud owner of a set of princess figurines. They are actually bath toys, but I knew she would love playing with them with her princess castle and she played with them all day long! We have never read Snow White or watched the movie, but she had remembered all about her from the ice show and she kept taking about taking a bite of the apple and she was clearly the favorite in the pack of dolls–so we also watched the movie. It’s the time of year where everything in stores starts to turn pink and red for Valentine’s Day. I have been busy gathering some cute craft ideas for Elin to work on and brainstorming some ideas for Valentine Cards. One idea that I have seen on Pinterest and on other blogs for awhile is the ever popular crayon molds. I found a heart silicone mold and the rest was history. I followed this tutorial. I have seen many different tutorials and they are all the same but I liked how her little trees and gingerbread men turned out that she made for Christmas so this is the one I followed. Everything was pretty easy. I peeled the papers of the crayons the night before since that part was the most tedious and then the next day I broke them up in little pieces. I didn’t let Elin in on that part because I don’t want her breaking her crayons that we use. But I did let her assist in putting them in the molds and making different color combinations. She loved looking at all the colorful pieces. I only used 3-4 different colors in a mold. I don’t like when there are too many colors and the colors mix too much. Also, I didn’t use any black, brown or gray. Then they were popped in the oven for 10-12 minutes at 250. I let them cool for 15 minutes or so before trying to pop them out. They popped out beautifully. These are my favorite ones. I love paintings by Jen Ramos and the swaths of colors remind me of some of the colors she uses in her paintings. I think these are so adorable and will make a lovely small gift to attach to a Valentine for a toddler or small child.